When the quadriceps tendon tears, the patella may lose its anchoring support in the thigh, and as a result the patella moves towards the foot. You will be unable to straighten your knee, and upon standing, the knee buckles upon itself. Surgery is performed on an outpatient basis and cannot be repaired arthroscopically since the tendon is outside the joint. 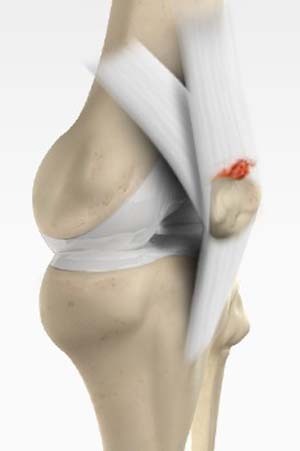 The goal of the surgery is to re-attach the torn tendon to knee cap and to restore the normal function of the knee. Sutures are placed in the torn tendon which is then passed through the holes drilled in the knee cap. The sutures are tied at the bottom of the knee cap to pull the torn edge of the tendon back to its normal position.